With this great vegetarian recipe you can enjoy all those lovely mushrooms available in the shops these days. 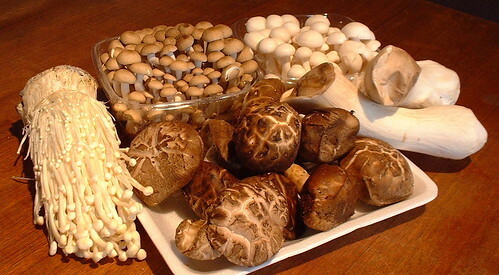 Just use whatever you can find, dried shii-take, dried porcini, oyster mushrooms, king oyster mushrooms, enoki, japanese shimeji, chestnut mushrooms or even your plain button mushrooms. Although I don’t often make a dinner without any meat, with this dish I really can do without. Serve with a simple green salad. Dissolve 1 stockcube into 1 liter of boiling water. Add sake and some of the soaking liquid from the dried shii-take. Just enough to make the stock rich and nice (be careful, there can be sand in this liquid). Keep tasting it until you like it. Soak the dried shii-take and porcini for half an hour (or longer) in some boiling hot water. Don’t throw away the liquid, but use some to intensify the stock you’ll need for the risotto. Tear the oyster mushrooms in strips. Cut the king oyster mushroom in bite-size chunks. Cut the shimeji mushrooms from the root/base. Chop the root end of the enoki mushrooms, gently separate the stems. Heat a frying pan until really hot. Add some oil and pan-fry the king oyster mushrooms on really high heat for about 2 minutes, until golden brown. Add the shii-takes and porcini chunks and pan-fry some more. Then add the shimeji mushrooms, not long after that the oyster mushrooms and quickly after that a big lump of butter. I like to add the enoki mushrooms now too, but maybe it’s better to add them later, directly into the risotto. 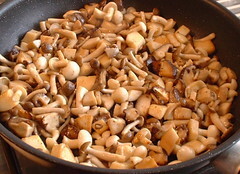 Anyway, set aside this pan with sauteed mushrooms to prepare the risotto. 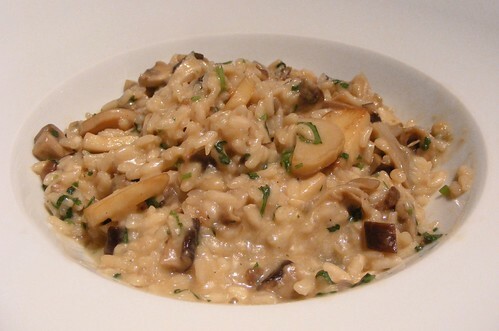 If you’re a pro in timing you can pan-fry the mushrooms just before finishing the risotto. I don’t like timing problems, so I do it before I start stirring the risotto. Remove from the heat, stir in a big handful of grated Parmesan. Then add back the reheated mushrooms. Add the coriander or parsley. Serve immediately. 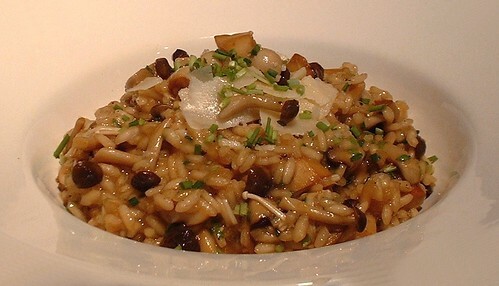 This entry was posted in Rice and tagged asian mushrooms, risotto. Bookmark the permalink.